WEIGHT LIMIT: 260 pounds. If you exceed this weight, please give us a call. BOAT TYPE: We raft the river in 18′ inflatable rafts that hold 4 passengers and a guide. The guide rows the raft with a long pair of oars. This trip gives the full canyon experience with the glories of Marble Canyon, the mysteries of the Inner Gorge, terrific side hikes and Indian ruins, crystalline creeks and waterfalls, cactus gardens and whitewater galore. For nearly three hundred miles, the river has cut a chasm over a mile deep through a rainbow of ancient rock. Nowhere on earth is there a more complete or dramatic geologic storybook. We spend the last night in the Lower Granite Gorge before a jet boat takes us past the Grand Wash Cliffs to our final destination of Lake Mead. We’ll meet at 7:00 PM at the DoubleTree Hotel in Flagstaff for a pre-trip meeting. This is an opportunity to meet your fellow travelers and guides and ask any last-minute questions. Your guides will give you a thorough trip orientation and pass out your waterproof river bags so you can pack your belongings that evening. Your Trip Begins. . .
At 7:00 AM you’ll board our van at the DoubleTree Hotel. By this time your waterproof bags should be packed, luggage stored, cars parked, breakfast eaten and room keys turned in. Our van will drive you to Lees Ferry (2½-hour drive) where we’ll load the rafts, give a river safety talk and fit you with a personal flotation device (PFD) before putting on the river. Our apprehensions are quickly converted to exhilaration as we splash through Badger & Soap Creek Rapids. The desert’s warmth quickly dries us again before we reach camp. After a delicious dinner we stretch out in our sleeping bags to drift off to sleep under a starry sky. The Adventure Continues. . . The vibrant colored walls of Marble Canyon tower overhead as we continue our float past the fern-fringed springs of Vasey’s Paradise for a stop at Redwall Cavern. This vast, half-circular chamber carved out by the river, offers a cool recess to rest. A few miles downriver we scramble over short, steep rock formations into Nautiloid Canyon where we find a unique display of fossils exposed in the smooth rock canyon floor. Relaxed drifting occupies much of the day interspersed by a few good rapids. A stop at Nankoweap Canyon gives us an opportunity to climb to the Ancestral Puebloan granaries that rest high on the cliff overlooking the Colorado River for a spectacular view of the river and vibrant canyon hues below. If we are lucky, the Little Colorado will be flowing with opaque turquoise (instead of muddy brown) water, which will invite us to stop for a swim. Sensational rides and dramatic pictures are produced in Granite, Hermit and the rapids of the “Jewels” – Crystal, Sapphire, Turquoise, Ruby and Serpentine. We camp after a refreshing swim in the pools and waterfall at Shinumo Creek. Those with sharp eyes and quick cameras may be rewarded with shots of desert bighorn sheep in this portion of the Canyon. The emerald paradise of Elves Chasm, with its chain of linked pools and waterfalls, invites us to explore and swim. A sand and gravel floor serpentines through the cool narrow slot of Blacktail Canyon. Here we have an up close look at the Great Unconformity where ancient erosion removed millions of years of rock to create a gap in the Canyon’s geologic record. Fluted walls of jet black schist enclose us for a few miles before Bedrock and Dubendorf rapids. We drift lazily through Granite Narrows (a mere 75’ wide!) and soon come to Deer Creek Falls, a 125’ cascade that tumbles almost directly into the river. A hike above the falls brings us to an oasis with a huge open patio. En route we discover handprints on the side canyon walls, evidence of those that visited this canyon centuries ago. We begin our morning gliding through some calmer stretches of river as we marvel at the walls towering overhead. A few quick strokes of the oars pull us into the mouth of Matkatamiba Canyon. We venture up the narrow limestone slot canyon into an overhanging amphitheater. Wading through the warm waters we explore the beautifully carved channel and relax in the coolness of its grotto. Back on the river we conquer Upset Rapid and then stop to camp for the night. Before sunrise we snack on yogurt and granola while packing sandwiches, fruit and candy for our lunches. An early start gives us a long day to enjoy the blue-green pools and numerous waterfalls of Havasu Canyon. Some linger all day at the pools near the river while others hike to see the falls several miles away. (A day pack or fanny pack are a “must” on this day.) After dinner the evening stars pale as our guides tell us tales (some real, some perhaps only “tall”) of the Colorado’s most legendary stretch of whitewater, Lava Falls. Tomorrow comes our turn in this fabled rapid. Pulling our rafts to shore, we follow a short, steep trail to scout this whitewater giant. Each raft in turn is swept into the churning, spitting power of the largest rapid in the Grand Canyon, battered by huge waves and flushed into calmer waters. Knuckles still white, we beach below the rapid to laugh at our fears and relive each shudder. When we reach Whitmore Wash we may do a passenger exchange. Some of our fellow passengers will helicopter out at this point, while others will helicopter in to join us for the last few glorious days on the river. As the canyon opens up we cross into the shattered Hurricane fault zone and then head west. 205, 209 and 217 Mile rapids discount the myth that all the good whitewater occurs above Whitmore Wash. We spend a delightful discovering, splashy, fun-filled rapids. Our last full day on the river, we slip past Diamond Creek and then enter the lower Granite Gorge. As we make our final camp at, or just above, Separation Rapid, we feel a strange sense of loss ― our adventure is coming to a close. The stars seem extra lovely tonight. After an early breakfast, we’ll load our gear into the jet boat. We’ll bid farewell to our guides and then head to Lake Mead (a 1½-hour, 40-mile ride). Arrive at the take-out point on Lake Mead by mid-morning. After equipment is loaded into our vehicles, we’ll be driven back to the Double Tree Hotel in Flagstaff, arriving between 3:00 and 4:00 PM. * Grand Canyon National Park Entrance Fee is refundable if you provide your Adventure Consultant with a copy of your National Park Pass prior to your trip departure. Sleep Kit: Can be rented for $50 per person. Sleep kits consist of a sleeping bag, deluxe 3-inch thick air-filled sleeping pad, ground tarp, sheet, pillow and pillowcase. Please indicate on your Guest Registration Form whether you want to rent a sleep kit or if you prefer to bring your own. 2-Person Tent: We provide 2 person tents. It is assumed you will share this tent with another person. You can (if you prefer) have a tent to yourself for an additional charge of $35 per tent. If you enrolled in a Trip Mate policy through OARS on or before December 9, 2018, the policy is still in place and will be administered by Trip Mate through the end date of your scheduled travel with OARS. All information provided in regards to the Trip Mate policy remains relevant. For a complete description of your Trip Mate policy, go online to: http://www.tripmate.com/wpF431S or call Trip Mate at 800-888-7292 (reference Plan # F431S). ☐ Trip Forms: Each participant will need to complete the required trip forms within two weeks of making a booking. Refer to your confirmation e-mail for the link to the online forms. If you prefer to fill out paper forms, please let us know right away. If you are reserving within 90 days of departure, your forms must be completed immediately to ensure we can properly plan for your trip. ☐ Reserve flights, shuttles and lodging: Confirm travel arrangements to and from your departure and return cities. Reserve overnight lodging for the night prior to your trip, if applicable. You may also wish to reserve a room for the night that you return from the river. It is important to make reservations early as rooms may be limited during peak travel periods. ☐ Physical Requirements: Your outdoor adventure will be an active participatory trip. Please inform us of any physical limitations you may have as soon as possible. Make sure you are exercising frequently in the months leading up to your trip. ☐ Final Packet: Approximately 110 days prior to your trip departure, a final packet of information along with an invoice will be sent to you including a mile by mile guide book of the Colorado River through the Grand Canyon. Flagstaff is the meeting and ending point for your Lees Ferry to Lake Mead trip. The day before your trip we will meet at 7:00 PM at the DoubleTree Hotel in Flagstaff for a pre-trip meeting. Check at the hotel front desk for meeting room information. Your trip leader will provide a thorough trip orientation and pass out your waterproof bags so that you can pack your belongings that evening. The trip leader will also reconfirm the meeting time for the following morning and give you an opportunity to ask any last-minute questions. American Airlines (800-433-7300) has flights into Flagstaff via Phoenix or Dallas. United Airlines (800-864-8331) has flights into Flagstaff via Denver. If you fly into Phoenix Sky Harbor International Airport, you can arrange to be met at the airport and transferred by van shuttle to Flagstaff. Passengers are dropped off at the Flagstaff Amtrak Station. Groome Transportation (928-350-8466): One-way fare is $49 per person. If you’re arriving by car, parking is available at the DoubleTree Hotel in Flagstaff for OARS/Grand Canyon Dories passengers who stay at the DoubleTree Hotel before or after their river trip. OARS cannot accept responsibility for any loss or damage to vehicles or their contents. Greyhound and Amtrak both service Flagstaff. Amtrak arrives each evening from the East and every morning from the West. On the final day of your river adventure, you will be returned to the DoubleTree Hotel in Flagstaff. You should arrive back by approximately 3:00-4:00 PM. We recommend that you reserve rooms well in advance at the hotel listed below, in order to guarantee lodging. Pre- and post-trip lodging is not included in the trip cost. $129/night (single or double occupancy). Prices subject to change without notice. To make a reservation, call the number above and mention that you are traveling with OARS/Grand Canyon Dories to receive the special rate (reservations open 12 months in advance). The DoubleTree also offers complimentary van transportation from the airport and Amtrak station. Call the hotel upon arrival for pick-up. On our Grand Canyon trips we use inflatable oar rafts, the most stable of whitewater craft, which are rowed from the center of the boat by your guide. Our rafts carry four passengers and a guide plus gear. We travel in a flotilla with the maximum group size of 16-20 passengers. There are 47 rapids rated 5 or higher on the Lees Ferry to Lake Mead section. Whitewater in the Canyon is rated on a scale of 1–10 (unlike most western rivers which use the I–VI scale). A “1” is a small riffle, and a “10” is the most difficult rapid still considered runnable. The two most noted of the Colorado’s rapids, Crystal and Lava Falls, are both rated a 10. The intensity of all rapids naturally depends on the water level, so readings for low and high water levels may vary slightly. Based on various circumstances such as water levels and current flow we on occasion find it necessary to have our passengers walk around certain rapids. The decision is made by the trip leader with the first concern being the safety of each passenger and second the ability to run a rapid without damaging the boats. This will give you a great opportunity to take some wonderful photos of the rafts as you watch your guides demonstrate their boating skills. When conditions warrant, you may also be asked by your trip leader to wear a helmet. For your own safety, however, you may feel more comfortable wearing the helmet even more than specifically requested by the trip leader. Each day varies, but on average you’ll spend three to five hours on the boats. The rest of the time is spent hiking and exploring side canyons, eating, or just relaxing in camp. The easiest hikes are no more difficult than negotiating a few yards of beach sand or stepping over a few rocks. Others may go for several miles over a rough trail, climb steeply up a hot hillside, require the use of both hands over awkward boulders and demand caution as you totter on a narrow trail above a steep cliff. Our guides are happy to help novices with hand and footholds and reassurance. Many times their helpfulness enables the timid and inexperienced to get to special places that many other groups pass by. Remember, however, all hikes are optional and you can choose to relax and take in a few tanning rays or read a book instead. We need to know as soon as possible about any dietary restrictions we must consider in planning your trip. If you have food allergies or restrictions, we will do our best to accommodate your needs. However, there may be a supplemental menu fee, ranging from $5 – $25 per person per day, to cover any increase in our costs. In camp we provide sodas, water, coffee and tea. We also carry powdered drink mixes such as Gatorade, Gookinaid or similar to mix in your water bottle. National Park Service regulations prevent us from providing alcoholic beverages to our guests. You are welcome to bring a supply of alcoholic beverages in non-breakable containers or you can order them using the alcohol order form which will be sent to you with your final invoice. Please Note: There is no drinking allowed while on the river. Consumption of alcoholic beverages is only allowed while in camp. Our drinking water comes from the river and is filtered through a purification system we provide. (No iodine is used in the purification process.) We store the purified water in large containers that are accessible in camp, at lunch time and before hikes for filling personal water bottles. Fishing is an additional activity you can do in camp or when we stop for lunch. The best fishing is on the upper section from Lees Ferry to the confluence of the Little Colorado River where the catch is trout, but you can fish anywhere along the river. The conditions are dependent upon the clarity of the water. You will need to purchase an Arizona state fishing license, which can be purchased online through Arizona Game & Fish at www.azgfd.com. A license can also be purchased in Flagstaff at Wal-Mart. We practice catch and release with artificial lures and flies. You should therefore de-barb your hooks before you leave home. You’ll need to bring your own gear and it’s best to have a collapsible pole in a case. We also carry a small container called the “day tripper” that can be easily accessed during the day should the need arise. It is a personal disposable toilet, which includes an odor-proof transport bag, chemical solidifier and odor eliminator, toilet paper and oversized hand wipe. On popular stretches of wilderness rivers, the common refrain is “dilution is the solution to pollution.” We practice this approach by urinating in the river during the day. For use in camp at night we provide pee buckets so that urination can occur in a secluded location and then be dumped into the current where it will be carried downstream. Bathing is only allowed in the river, but is definitively not allowed in any of the side streams that feed into the river. If you plan to bring soap, we recommend using a liquid biodegradable soap such as Campsuds or Dr. Bronner’s (www.drbronner.com), which can be purchased in most stores that have a camping section. Disposable anti-bacterial towelettes (Coleman Swash Cloths, baby wipes, etc.) are good alternatives to submersion in the river and are especially convenient for spring and fall trips. Good foot care is a must. You should have footwear that is comfortable and well broken-in, but is newer and will not fall apart. Closed-toe shoes are the best protection for hikes. Avoid sunburn and try and keep your feet out of the water. Keep your toenails trimmed. After a day on the river, wash your feet with soap, moisturize and put on clean, dry socks and shoes. Always wear shoes, even in camp. If you experience any foot care problems, ask your guides for assistance. It’s very important to take care of your skin while on your Grand Canyon trip. The combination of sun, sand, water and wind quickly causes extreme dryness, which can then lead to cracked skin. Once your skin cracks it will have a hard time healing until you return home. Hands and feet tend to take the greatest beating and therefore should be given the most attention. When you arrive in camp each afternoon it is a good idea to bathe and moisturize your skin with a heavy-duty moisturizer. Put on clean, dry shoes to give your feet a break from the elements. Some people also like to apply moisturizer to their feet and hands before bedtime and then cover them with socks and/or gloves. Each morning before leaving camp, apply plenty of sunscreen and remember to reapply during the day. By drinking plenty of water and staying well hydrated you can also help prevent your skin from cracking. *The use of drones is prohibited by the National Park Service in the Grand Canyon. Flagstaff is about 7000 feet/2,135 m above sea level, therefore you may experience symptoms associated with altitude illness. We recommend the following measures to help prevent altitude illness: arrive ahead of your scheduled departure to allow for acclimatization; drink 3-4 quarts of water every day; make sure about 70% of your calories come from carbs; only use alcohol, tobacco or sleeping aid medications in moderation or not all. Please familiarize yourself with symptoms, treatment and more about altitude illness at the CDC. In the desert climate of the Grand Canyon, temperatures and weather can fluctuate a great deal throughout the day. It can be clear, dry and hot and in the next moment it can be cool and rainy. These conditions can manifest in any month. There are no absolutes when talking about weather in the canyon. The descriptions and chart below lists average weather conditions, maximum and minimum temperatures and average rainfall. This chart should be used only as a general guide. Packing according to the list will prepare you for all weather conditions. April: April is less crowded in the canyon and is an excellent time to view cactus in bloom. The days are shorter with a chance of possible storms, but at night you can sit around the campfire (April & October only). May: A favorite time for people to visit, but also one of the most crowded. The weather is moderate and consistent, but can be windy at times. The water is very often clear from mid to late May. June: Early June has hot days and mild nights. Temperatures increase with each day into the month. A very busy time to be in the canyon. July: Very hot with the chance of some early monsoons, which are more prevalent in August. Any and all weather can be experienced at this time. When rain showers do materialize the afternoons are generally cooler. August: Traditionally this time of year is the monsoon season with clouds building up early in the day, releasing with heavy short bursts in the afternoon, and often clearing by evening. The clouds and showers help lower the extreme temperatures. September: Moderate temperatures cooling as the month progresses. The days are mild with cool nights. There is less traffic in the canyon since September 15 is the last launch date for motorized trips. October: Can be very nice, but always presents a possibility of storms. Need to be prepared for changes in weather conditions. Nice temperatures for side hikes and opportunities to sit around the campfires at night (April & October only). Summer Temperatures (June, July & August): Please note that the average summer temperatures listed can be misleading. These temperatures are recorded in very specific locations and circumstances. In the summer it is not uncommon for the temperature to rise above 110° F. At the same time temperatures can suddenly plummet with increased cloud cover. The advice is to always be prepared with rain gear and clothing that can be layered. You may want to check one week prior to your trip for an up-to-date forecast. We recommend the National Weather Service web site. The web site provides a current weather forecast along the Colorado River as well as on the rim. 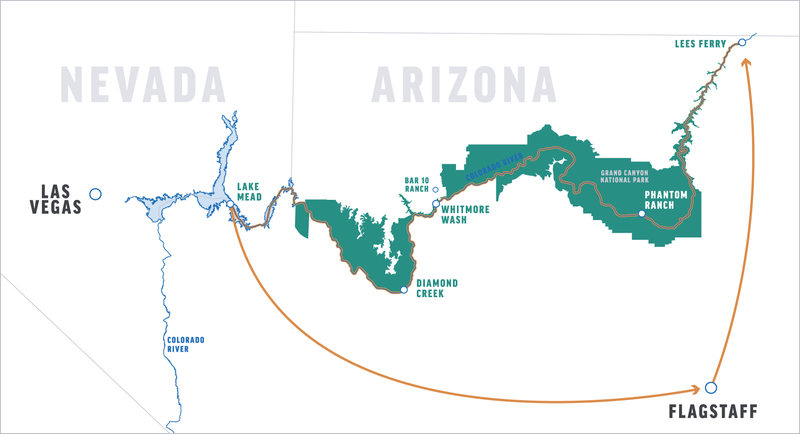 The water levels of the Colorado River through the Grand Canyon are regulated by the release of water from the Glen Canyon Dam. The Colorado generally fluctuates up and down several feet within the day, based on the time of year and demand for electricity. Because the flow is dam regulated, even in a drought year, the water levels are fairly consistent. The temperature of the river is always 48°-55° F.
During the day—Wide-brimmed hats are a good choice for sun protection. Ball caps are also useful since they fit under helmets, which are required in some of the larger rapids. Each passenger is required to wear a PFD (personal flotation device) while on the boats and in the water. On the first day of the trip you will be issued a PFD that will be yours to wear for the duration of the trip. The guides will make appropriate adjustments to your PFD to ensure a proper fit. (Please note: You must weigh less than 245 pounds and have a chest size smaller than 56” in order to fit into the PFD.) For your added protection, in some of the larger, more challenging rapids, your trip leader will also ask you to wear a helmet. Some passengers may decide to wear it even in some of the smaller rapids. Synthetic or merino wool long underwear is a must-have on river trips. It can be worn under shorts, rain gear, T-shirts, etc., then stripped off when the chill of the morning has worn off. It keeps you warm even if it’s wet (which can happen easily), dries quickly, and it’s compact enough to be stuffed into your small waterproof bag or daypack after you take it off. It can be layered under your waterproof rain jacket and pants. In cooler weather a rain jacket and pants work better than a wetsuit, because the jacket and pants can be put on when it’s cold, or when you’re going through whitewater, then easily taken off when the sun comes out and it’s hot. Be aware that cotton items, once wet, do not insulate; only synthetic and wool materials will keep you warm during cool, wet weather. April, Early May, Late September and October Trips: These are surely some of the most beautiful months in the canyon, but they can also produce some surprisingly chilly times. During the spring and fall the sun is not far enough north in the sky to reach its warming rays down into the bottom of the canyon for as many hours a day as it does in the summer. This means more shady areas, fewer sunny ones. The temperature of the river is the same in August as it is in January, 48°-55°. Therefore, when you are splashed (drenched) going through the rapids and you’re in a shady area, you will get very cold unless you are prepared. Bugs and mosquitos are generally not a problem on this trip, although it’s a good idea to come prepared with a small amount of insect repellent just in case. You can either bring your own sleeping bag, pad and ground tarp, or you can rent our sleep kit. If you are purchasing your own bag for the trip, keep in mind that a medium weight synthetic-fill bag is recommended for April and October. ☐ Extra Dry Skin Cream: Look for creams that have such labeling as healing, therapeutic, salve, for rough cracked skin, etc. Healing foot creams are also a good idea. At the pre-trip meeting each person will be given two large waterproof bags (approximate sealed size: 20” tall x 14” diameter; 3079 cu in; 50.4 L). One bag will be for your clothing and personal items. The second bag will be for your sleeping gear (sleeping bag, sleeping pad, ground tarp, sheet and pillow). These two bags will essentially be your “checked luggage” and will only be accessible in camp. Tents are stowed separately. Please note: if you rent our sleep kit, it will come already packed in one of the two waterproof bags issued to each passenger. We also provide a small waterproof bag for day use where you can keep items such as raingear, camera, sunscreen, lip balm, etc. (approximate sealed size: 17” tall x 9” diameter; 1081 cu in; 17.7 L). The bags are cylindrical in shape and pack from the top. Your daypack will also be with you during the day. To prevent items from getting wet in your daypack, it is a good idea to first place everything into a plastic bag and then into the daypack. Please pack light; river attire is very casual―comfort, convenience and boat space takes precedence over style. At the end of the trip you will return to Flagstaff with your packed waterproof bags where you will be able to unpack your gear for your return trip home. Clothing can easily be washed out in the river with biodegradable soap. With the dry, warm climate in the canyon, lightweight clothing generally dries out quickly. Please Note: The color of the river fluctuates from completely clear to very silty. Light colored clothing has the possibility of becoming permanently stained. We recommend you take on the river only what’s absolutely necessary. Keeping gear to a minimum ensures it will fit into the waterproof bags we supply and reduces unnecessary packing and unpacking in camp. If you do have extra luggage you do not wish to take on the river, OARS has arranged a special storage room at the DoubleTree Hotel where passengers may store additional bags. Your trip leader will explain the storage procedure at the pre-departure trip meeting. Leave your valuables at home. For necessary personal items such as a wallet, credit cards, etc., we recommend putting them in a zip-lock bag at the bottom of your waterproof bag with your clothing. In reviewing your statement, you’ll note your trip cost includes a $1/person/river day donation to the Grand Canyon Fund, an environmental trust fund. Your contribution will be deposited with the foundation, through which grants are distributed to organizations such as the Grand Canyon Trust, Friends of the River, etc. This donation is voluntary and may be subtracted from your trip cost if you choose not to participate in the program. Please notify our office if you choose not to participate. If you enjoyed your trip, consider donating to The Pam & George Wendt Foundation. This organization is a not-for-profit 501 (c) 3 organization with the express goal of providing opportunities for young people to experience the magic of the outdoors. Visit www.oars.com/oars-foundation/ to learn more about how a tax-deductible donation can change young lives for the better. A $1000/person deposit is required at the time of reservation for all Grand Canyon trips over five (5) days in length. A second deposit of $500/person is due in our office by November 1 of the year prior to your trip. For Whitmore Wash to Lake Mead trips a deposit of $500/person is required at the time of reservation. A second deposit of $500/person is due in our office by November 1 of the year prior to your trip. If you make your reservation after November 1 of the year prior to your trip, the entire $1500 or $1000 deposit is due at the time of reservation. Statements will be mailed in ample time to remind you of the payment due date. If you find it necessary to cancel your trip, please notify us as soon as possible. The cancellation fee after you’ve made your deposit can range from $250 up to the entire trip cost, based upon the number of days prior to your trip that we receive your cancellation notice. We regret we cannot make exceptions for personal emergencies. For this reason, we strongly urge you to consider purchasing a travel protection plan (see Travel Protection). * If you are traveling as part of a charter group please note that deposit/cancellation policies differ from those listed above. Charter Policies can be found on the group leader’s contract & on the Charter Trip Visitor’s Acknowledgement of Risk Form. Under most circumstances, if you are of an adventurous spirit and in reasonably good health, you should have no problem enjoying an O.A.R.S. Grand Canyon, Inc. trip. People with heart trouble and pregnant women should have their physician’s approval before taking an adventure travel trip. Grand Canyon National Park Service regulations prohibit individuals from participating in more than one recreational river trip (commercial or non-commercial) per year on the Lees Ferry to Diamond Creek section of the Colorado River. Because of this regulation, O.A.R.S. Grand Canyon, Inc. cannot accept a reservation from any individual who has or will participate in any other full or partial canyon commercial or non-commercial river trip within the same calendar year. If you have already completed or have plans to participate in any other Grand Canyon river trip during the same year you are traveling with us and would like to go again, please wait until the following year or later for your next trip. Grand Canyon National Park’s one-trip-per-year rule is strictly enforced by the National Park Service. Everyone is required to sign a standard Acknowledgement of Risk form before the trip, acknowledging awareness that some risks are associated with the trip. Safety is of the utmost concern on our trips. However, due to the nature of the activities, a condition of your participation is that you will sign this form and return it to our office before the trip begins. Anyone who refuses to sign the form will not be allowed to participate, and consistent with O.A.R.S. Grand Canyon, Inc. cancellation policy, there will be no refund of the trip fees at that time. O.A.R.S. Grand Canyon, Inc. and cooperating agencies act only in the capacity of agent for the participants in all matters relating to transportation and/or all other related travel services, and assume no responsibility however caused for injury, loss or damage to person or property in connection with any service, including but not limited to that resulting directly or indirectly from acts of God, detention, annoyance, delays and expenses arising from quarantine, strikes, theft, pilferage, force majeure, failure of any means of conveyance to arrive or depart as scheduled, civil disturbances, government restrictions or regulations, and discrepancies or change in transit over which it has no control. Reasonable changes in itinerary may be made where deemed advisable for the comfort and well being of the participants, including cancellation due to water fluctuation, insufficient bookings and other factors. There is risk in whitewater rafting, particularly during high-water conditions. Rafts, dories and kayaks do capsize. You could be swept overboard. Your guide will make every attempt to assist, but you must be strong and agile enough to “self-help” and “float-it-out” without further endangering yourself or others. We reserve the right not to accept passengers weighing more than 260 pounds or with a waist/chest size exceeding 56 inches. We may decide, at any time, to exclude any person or group for any reason we feel is related to the safety of our trips. We are experienced at accommodating people with various disabilities. Please give us an opportunity to make you feel welcome. We need to discuss any special requirements ahead of time. On advancement of deposit the depositor agrees to be bound by the above recited terms and conditions. Prices subject to change without notice.